The big question that we should all be asking after this first debate is this: Have we learned anything since 2004? In other words, have Democrats figured out that winning debates is about framing principles, not bouncing facts? At the end of the first official 90 minutes of the 2008 campaign, the answer is "sort of"--some yes, some no. Unfortunately, the format was terrible ("20 second answers, please...") and many of the questions were ridiculous ("Name your favorite Supreme Court Justice.") But despite that, a strong Democratic candidate who expects to get the nomination should have treated every question as a chance to move the debate to big principles that framed--not just individual answers--but the entire conception of government, foreign policy, health, and the public good. Who was the best at that in tonight's debate? Although I could not make it down to Orangeburg, SC to watch the events in person, I will be live blogging the broadcast of the Democratic Party First-in-the-Nation 2008 Presidential Candidate Debate starting at 7pm EST. Stop by to read along and contribute to the comment thread. ThinkProgress reports that Senator James Inhofe (R-OK) has called for mob rule against Harry Reid in response to the Senate Majority leader's criticism of failed Bush policy in Iraq. Inhofe joins disgraced and indicted ex-Congressman Tom Delay who recently accused Speaker of the House Pelosi and Senate Majority Leader Reid of treason. Reid, Pelosi and the rest of the Democratic leadership cannot allow these irresponsible charges from Republicans go unanswered for one minute. Instead, they should immediately reframe the debate, stealing a page from Abraham Lincoln by asserting, not just their right to speak, but the purpose of the war. "The President needs a history lesson," they should say. This war and the President's refusal to listen to the voice of the people is a betrayal of American principle. Speaker Pelosi and Majority leader Reid must continue to stand up and hold their ground. As reported by a variety of sources, Congressman-turned-indicted-criminal Tom Delay has accused the Speaker of the House of Representatives and the Leader of the United States Senate of Treason. I looked it up while we were driving over here, what the definition of treason is. It's the betrayal of trust. I have never in my adult life, nor in my understanding of history, seen something so blatantly outrageous for political reasons." Let's see here...are supposed to believe that Tom Delay keeps a dictionary in his car? OK, that's possible. Unlikely, but possible. Delay could have sent a text message to Google Mobile from his cell phone, but he still would not have returned "betrayal of trust" as the definition." David Finkel has written a stunning article about Iraq for The Washington Post, telling the story of Army Maj. Brent Cummings' and a rotting corpse in a Kamaliya sewage pit. It is a story that reveals, as Jessica Lynch would say, the true heroism of our soldiers when the hype is stripped away. Finkel's description is a window onto a moment that damages a soul, a snapshot of the exact moment when President Bush's brutish policy grabs hold of an American soldier and ruins his life. Even stronger than that, Finkel's piece is the most respectful, honest and utterly devastating description I have read of the madness our soldiers face everyday in Iraq. Reminiscent of Joseph Heller's Catch-22, Finkel tells the story of one Army officer trying to remove a corpse floating in a cesspool beneath an abandoned Iraqi factory--a task that needed to be completed so that the Army could turn the site into a U.S. military outpost. Along the way, Cummings tries to find a balance between military objectives, local culture, human feelings and omnipresent deadly violence--between Muslim customs, the well-being of resident families, the mental health of U.S. soldiers, and the reality of a world where every object and every inch of land must be treated as an unexploded bomb. And after all this balancing, all these difficult decisions, all the problem solving, all the good that a group of young soldiers can try to do for the world--it all turns out to have been in vain, useless, for naught. Although Finkel never criticizes directly, the rotting stench of Bush's kingly intransigence seeps from every page of Army Maj. Brent Cummings' story. While the article relays the absolute humanity of our soldiers, it also turns a corpse in a cesspool into a metaphor for the entire Bush policy in Iraq. 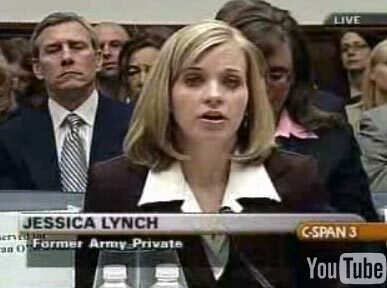 Former Army Private Jessica Lynch gave testimony, today, during the House Committee on Oversight and Government Reform Committee hearings. Beyond the raw, emotional power of her statement--Lynch teaches us a lesson that we generally forget: that the bravado we see and hear about on TV too often obscures the truly heroic deeds of our enlisted men and women. Lynch also teaches us that soldiers are better than the rest of us at talking in real terms about acts of incredible courage and, ironically, of experiences of unbelievable fear. It is tough to imagine how the members of the committee could make it through Lynch's testimony without crying. Before President Bush goes any further with his secret plan to wall off a dozen Baghdad neighborhoods in concrete fences, he should first read a poem by Robert Frost, and a speech or two by Ronald Reagan and John F. Kennedy. If President Bush had learned any lessons from American history, he would understand that our job is to tear down walls, not to build them. The Washington Post has a disturbing story about the latest U.S. tactic to control violence in Baghdad: build walls. Lots of walls. Here we see the U.S. army reverting to the logic that [security] is [a wall]. But are these new walls keeping the bad guys out or trapping good people in what amounts to a large prison? The testimony of Alberto Gonzales to the Senate Judiciary Committee has demonstrated a new low in the Bush Administration. Among other things, Gonzales' answers have made it clear that he is anything but the "CEO" of the DOJ, as he once tried to argue. The only answer he has given that appears to be his own actual thought is that U.S. Federal Attorney's "serve at the pleasure of the President." Whenever he says that, I believe he has actually had that thought on his own before. Beyond that, every answer from Gonzales has sounded like an answer to an oral exam that he only just crammed for the previous night. If I had to throw out one word to describe his performance, it would be: stammering. But within all this, I pulled out a few choice moments where his attempts to not get caught in his own lack of preparation have resulted in statements of accidental spiritual power. Behold! The Tao of Gonzo. In the face of great tragedy, what often distinguishes Americans from other national cultures is our incredible ability to talk about our pain in public as a way of healing. When horror strikes, we do not buckle over alone and stay silent, but walk into the public square, reach out to one another and chew our way through the pain. It is in these moments that Americans--all too often self-absorbed with the day-to-day of making ends meet--find each other again, share the details of the people we have lost, and remember that we are not alone. As I watched the public response to the tragic violence in Blacksburg, I was filled with sorrow in the face of all the death, but my sorrow quickly found a place with the outpouring of voices that has risen up in response. Due to the tireless voices, I now know the names and faces of many of the people killed as their stories fan out across the media and take root in our hearts. But in the midst of all the past 48 hours of talking, crying and slow healing, I have also been left--as have many--with a question almost too painful to ask: Why have we not been able, neither as a as a nation nor as individuals, to talk about the violence and pain suffered by Americans and by Iraqis? Why does the violence in Blacksburg bring out the very best in our American character--our ability to join together and heal--while the recurring violence in Baghdad--experienced by Americans and Iraqis alike--has left us sitting alone?